The Dynavector PHA-200 phono head amplifier is a unique current amplifier that offers the best performance for most moving coil cartridges. The PHA-200 is a complete redesign of our PHA-100, using new circuitry and the most advanced, highest quality components. The most unusual feature of the PHA-200 is its amplification method. Conventional phono stages or step-up transformers are designed to accurately amplify the very low output voltage of moving coil cartridges. In contrast, the PHA-200 extracts the maximum current signal from the cartridge, and then this current is converted into a voltage high enough to drive a conventional line level pre-amplifier. In the PHA-200 the coil of the cartridge is short circuited or terminated by zero ohms, consequently the current from the coil is much larger than with conventional voltage amplification. All cartridges have magnetic distortion caused by nonlinear characteristics within the magnetic materials of the cartridge components. These distortions have an adverse affect on the sound quality. By using current amplification and extracting the current signal, the magnetic distortion of the cartridge is significantly reduced. In other words the linearity across the reproducible frequency range for the cartridge is improved. As a result the PHA-200 is able to amplify the original cutting signal on records as precisely as possible. The sonic advantages of the PHA-200 compared to conventional phono stages or step-up transformers is immediately apparent. The neutral soundstage, rich mid-bass and smooth highs are most impressive. The overall sound quality offers improved transparency and resolution. A unique patented current maximizing circuit designed to provide maximum fidelity from vinyl LP's. We call a Phono Enhnacer. 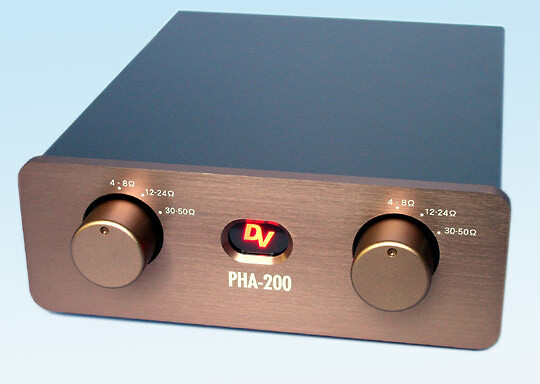 NOTE: The PHA-200 should be connected via a moving magnet phono input as the PHA-200 does not feature RIAA equalization. 3 position input resistance selector to suit most MC cartridges. Left and right channels are completely separated but have identical signal paths. Left and right channels are completely separatedThis is achieved by using mono-symmetric circuit design. The input selector switch is an extremely low contact resistance type rated for minute currents. The switch has separate sections for each channel. High-grade components are used. All components are carefully selected following repeated listening tests. Extra low noise stabilized power supply with high-grade, parallel connected, electrolytic capacitors in the smoothing circuit. An R-Core transformer that offers improved voltage regulationR-core transformer is used and reduced flux leakage is used. The transformer has magnetic and electrostatic shields.